PLEASE NOTE: this is a PHONE-FREE show. No photos, video or audio recording devices allowed. We think you’ll enjoy looking up from your gadgets for a little while and experience music and our shared love of it IN PERSON. Upon arrival at the venue, all phones and other photo or video-capturing gizmos will be secured in a Yondr pouch that will be unlocked at the end of the show. You keep your pouch-secured phone on you during the show and, if needed, can unlock your phone at any time in a designated Yondr Phone Zone located in the lobby or concourse. For those looking to do some social media postings, let us help you with that. The official tour photographer will be posting photos and videos after the show at jackwhiteiii.com and the new Jack White Live Instagram account @officialjackwhitelive. Repost our photos & videos as much as you want and enjoy a phone-free, 100% human experience. 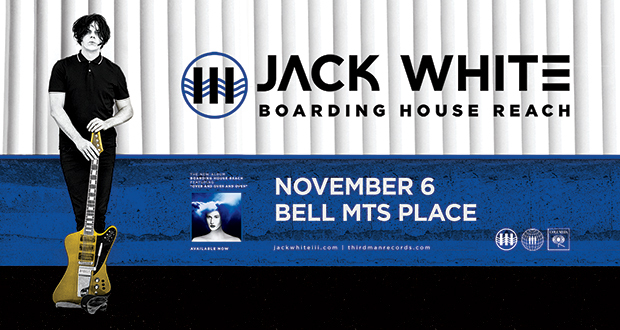 Jack White will continue his BOARDING HOUSE REACH world tour with a trek across Canada beginning November 2 at Edmonton, AB’s Rogers Place and culminating on November 14 at Halifax, NS’s Scotiabank Centre. A limited amount of pre-sale tickets will be available to Third Man Records Vault members starting tomorrow, August 14 at 10 am (local). Tickets go on sale to the public at 10am local time on Friday, August 17.